The students in Flight Club share their love of drones. The electricity of concentration and excitement fills the air as students work hard on building and designing drones. Words like “soldering” and “wiring” surround the students as they figure out the next steps to creating their drones. Meanwhile, other students are spending time on the computers, which simulate flying drones. Using the controls on the computers, students are able to fly drones over grassy parks, buildings and lakes. This is just a normal club meeting for the students of Flight Club. Flight Club, also known as Drone Club, is a fairly new club to LHS started by Industrial Tech teacher Gary Pierson. Although it’s still a small club, it’s building quickly, gaining more students and opportunities. The students in the club are not only trying to expand the club within LHS, but also to other schools. 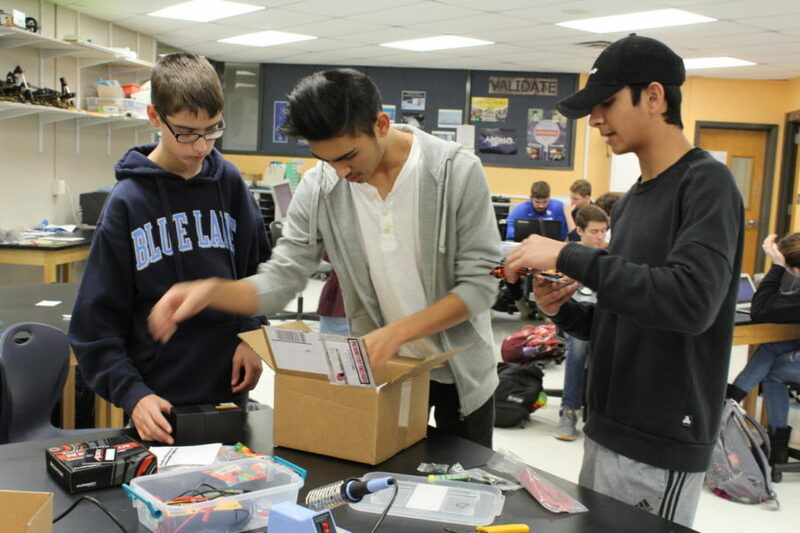 A possible tournament or competition is in the works, and the LHS Flight Club is working with other schools who have similar programs to get a tournament or competition up and running. Most people don’t know of all the ways drones can be used other than just flying around neighborhoods. In the club, students are able to learn the appropriate ways to use drones and the activities that can be done with them. Electronics, wiring, control systems and videography are covered in the club. Along with the knowledge gained from these topics, the members also have lots of fun. Students are able to apply what they learn in the club to Science, Technology, Engineering and Math (STEM) and other technological fields, as well as all the ways drone technology can be used in areas such as film, marketing and photography. This school year the students in Flight Club will build two drones. Building drones takes immense patience and problem solving abilities, but they’re up for the challenge. Flight club welcomes new members, and wants to spread the word about the club as much as they can. “The club is opened to all who are interested in technology in more of a competitive technological field, and anyone interesting in drone videography,” Pierson said.